Low Hours, Mint Condition! Loaded! Full 6 Year Yamaha Warranty! Full Ranger Warranty! 2009 Trailer 2410 AF 6000 Best on the Market! Spring Fishing! What's to come? Reserve your 2010 date early! 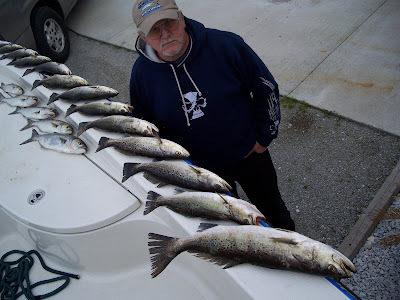 Spring is near and we should begin to see a turn in our weather and water temperatures. Mike and I have spent the Winter targeting massive schools of Wintering Reds as well as some Speckled Trout and Black Drum. 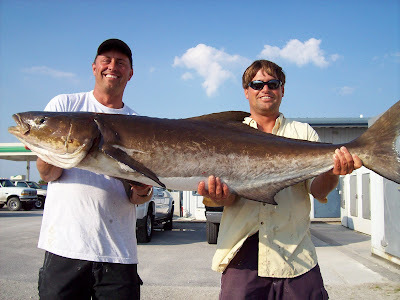 Lately, we've turned to the Spring nearshore bottom bite and here's what to expect if you're interested in a fishing trip this Spring. March- We're already doing well with the nearshore bottomfishing. 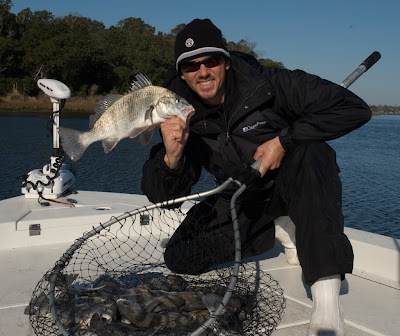 Due to the commercial closures we've got plenty of keeper sea bass on the nearshore bottoms. 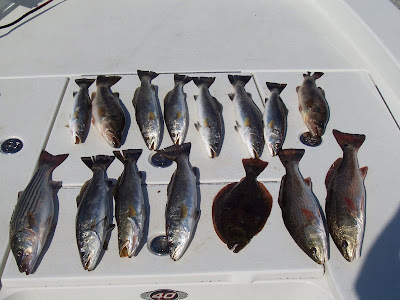 Bottom fishing trips include Seabass, Grunts, Ringtails, and Tautogs. The action is often non-stop! We're also targeting large schools of redfish along the surf zone and some smaller schools of redfish in the backwaters. 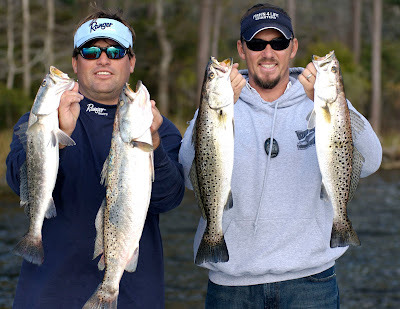 March will also offer the chance for Neuse River Trout and Striper. 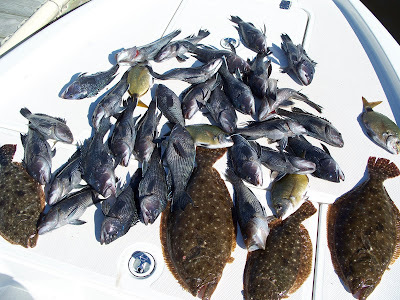 April- By April we will still be targeting those nearshore bottomfish but will begin to see flounder mixing in with the catch and the chance to sightcast to albacore and bonito. 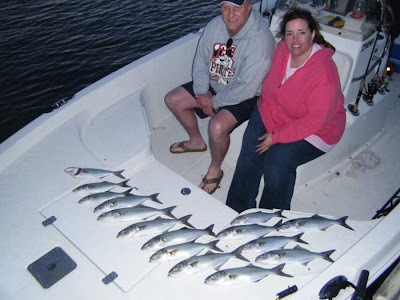 The redfish will begin pushing into the backwaters in better numbers and there will be a big run of bluefish from 1 to 5lbs. 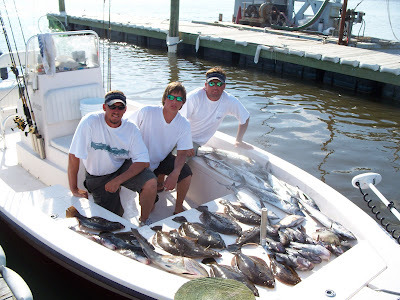 The ICW and surf will begin holding loads of Sea Mullet, Blowfish, and Grey Trout too. 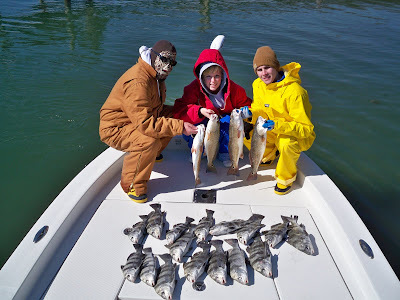 (mid to late april offers the opportunity for some great family fun trips with lots of early season inshore action) The Neuse River will still offer the opportunity for Striper and Trout. Sale on Boat Wraps, Banners, Signs and More! Crystal Coast Graphics, one of our Sponsors, is having a limited time special on various types of Vinyl Wraps. 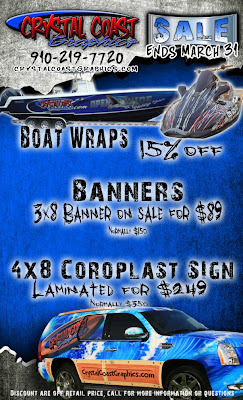 Throughout the rest of March Chris and his staff are offering great discounts on Boat Wraps, Banners, and Signs! 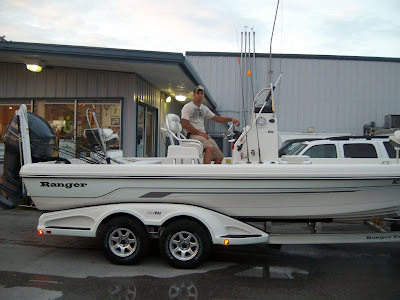 I've personally had two boats and a truck wrapped by Crystal Coast Graphics and truly feel that they offer the highest quality grapics and vinyl. Their workmanship is excellent! There is absolutely no better local advertising. I get business inquiries several times a day and the wrap invites people to be more open and talkative. It shows potential clients that you're serious about your business or hobby. Call the staff of Crystal Coast Graphics today for all your wrap, banner, and sign needs. 910-219-7720 or click on the picture above to go to their website.